Five conservation groups filed a lawsuit Monday seeking to block oil production from a proposed artificial gravel island in federal Arctic waters. The groups asked the 9th U.S. 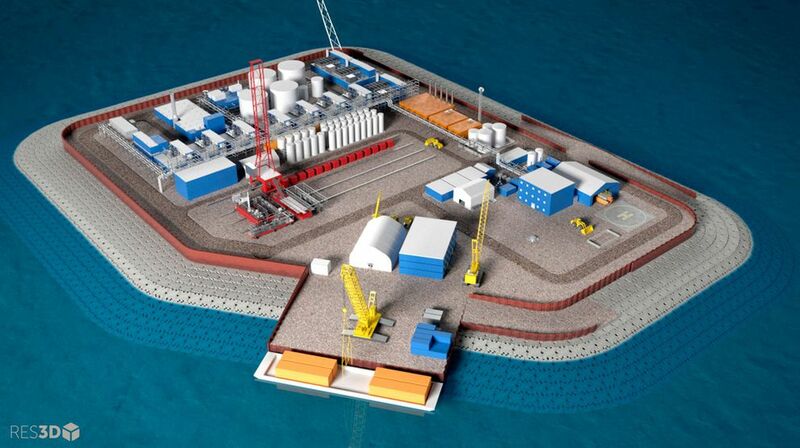 Circuit Court of Appeals to review an offshore production plan approved for the Liberty project in the Beaufort Sea off Alaska's north coast. The groups said the plan violates federal law governing outer continental shelf drilling, the environment and endangered species. The Trump administration failed to consider impacts of an oil spill in remote Arctic waters or effects of drilling on polar bears and other endangered species, said Kristen Monsell of the Center for Biological Diversity, one of the groups that sued. "An oil spill in the Arctic would be impossible to clean up in a region already stressed by climate change," she said. Drilling law requires the administration to reject development if the risks to the human and marine environment outweigh the benefits of oil extraction. That includes both spills and climate change, Monsell said. "Here the agency used the totally inadequate analysis that actually found that the 'no action' alternative - not approving the project - would actually result in more greenhouse gas emissions, which is just completely ridiculous on its face, and also ridiculous given the modeling they used," Monsell said. The Bureau of Ocean Energy Management did not immediately respond to an email request for comment Monday. BOEM in October approved a plan submitted by Houston-based Hilcorp for production wells on an artificial gravel island proposed in 19 feet of water about 5.6 miles off shore. The site is 15 miles east of Prudhoe Bay, North America’s largest oil field. Hilcorp plans to extract oil from federal leases sold in the 1990s. BP Exploration Alaska drilled at the site in 1997 and sold 50 percent of the assets to Hilcorp in 2014. The base of the gravel island would cover 24 acres of ocean floor, about the size of 18 football fields, with sloped sides leading to a work surface of 9 acres, the size of nearly seven football fields. To create the island, trucks would travel by ice road to a hole cut in sea ice and deposit 83,000 cubic yards of gravel. The surface would have room for 16 wells. Hilcorp anticipates extracting 80 million to 130 million barrels over 15 to 20 years. Hilcorp proposes to move oil to shore by buried pipe. Liberty would be the 19th artificial drilling island in Alaska, including four now pumping oil from state waters. Liberty spokeswoman Lori Nelson did not respond to a request for comment Monday. The four other groups suing are Friends of the Earth, Greenpeace, Defenders of Wildlife and Pacific Environment. They’re represented by environmental law firm Earthjustice.